Last few places available for our evening of discussion and networking at the inaugural Security & Policing Dinner; sponsored by Airbus. 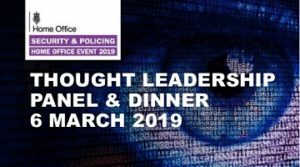 The evening will begin with a thought leadership discussion dedicated to the theme of Tackling Crime in the Digital Age. With industry representatives from Facebook and Airbus alongside Government and law enforcement, it will be an interesting session. The evening continues with a drinks reception followed by dinner where the keynote speech will be delivered by the Director General of the Office for Security and Counter-Terrorism, Tom Hurd.